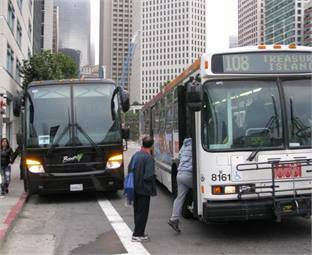 SAN FRANCISCO — Reuters reported that a coalition of transit and housing activists and a labor union have sued the city and county of San Francisco over a pilot program that gives shuttles run by Google and other private companies access to municipal bus stops. The coalition claims that the program favors higher-paid technology workers over low-income residents. The lawsuit argues that in addition to displacing low-income workers, the buses will increase pollution, boost risks to pedestrians and bicyclists and interfere with public transit. For the full story, click here.